British Sea Power have been an ambitious band from the start. From their first guitar scribbles on 2003 debut, The Decline of British Sea Power, through the more streamlined songwriting on the 2005 follow-up, Open Season, the Brighton band have pushed themselves and their craft beyond simply re-creating rock music: The band perform dressed in vintage military uniforms on stages decorated with foliage, yet they never come off as ironic. Their approach is playful yet cerebral, like a logic puzzle. 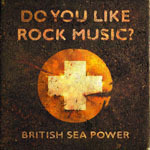 So, although the title of their third album, Do You Like Rock Music?, might seem overly straightforward for such a elusive group, its inquisitiveness is crucial: British Sea Power would like us to abandon our genres, subgenres, and microgenres. To hell with indie, post-punk, and new wave; for British Sea Power, all of these fall under the rock rubric. To this rock-critical end, the band recorded Do You Like Rock Music? around the world-- in a Czech forest, in a crumbling fort in Cornwall, and most tellingly, in Montreal with the Arcade Fire's Howard Bilerman and Godpseed You Black Emperor's Efrim Menuck. This is a band going for broke by going global. They inflate the plaintive guitar pop of Open Season to monumental proportions, amplifying every element until it sounds enormous and overwhelming. The epic choruses and chiming guitars on "Waving Flags" and "Down on the Ground" sound immodest, as if the overzealous band wants to convert all you nonbelievers: You don't just like rock music, you love it, you need it, you worship it. Rock music has a wonderful plan for your life. The recording work by producer Bilerman, along with Menuck and Graham Sutton (of Bark Psychosis), sounds decorous but often impersonal. A quick-moving guitar winds through the first measures of "Lights Out for Darker Skies", but the band's wall of sound violently overtakes it. Later, the scrappy guitars on "A Trip Out" sustain the song from start to finish before "Open the Door" dials it back for a surprisingly tender folk-pop chorus and a strong, short guitar solo. But "Canvey Island" weighs down the album's middle section with its hesitant pace and expository lyrics: "Like Canvey Island, 1953. Where many lives were lost, and the records of a football team." This type of matter-of-factness forestalls any real wonder at the serendipity of nature and history (the song references a fatal flood), which British Sea Power conveyed so eloquently on previous albums. Despite the implications of the band name, British Sea Power don't work as well at this size and scope. They're in danger of becoming the Alarm to the Arcade Fire's U2. Curiously, these stadium-sized songs channel less passion, anger, or awe than their earlier work. Granted, emotion has never been the band's strong suit, but here, British Sea Power speak the language of big feelings with little to back it up. Do You Like Rock Music? sounds empty at its core, with a rock where its heart should be. After a stellar debut and a lackluster follow-up, British Sea Power prep us for their third album with this EP-- the first recording to capture the anarchic joy of the band's live performances. On its sophomore LP, the UK band trades idiosyncrasy for accessible pop melodies.